With the honourable exception of their uplifting theme to the 2012 Olympics, tee-total nu metal quintet Elbow have been uncharacteristically quiet for a couple of years. But they popped up at midnight to unveil a new, two-part song, Fly Boy Blue / Lunette. You should know what to expect by now: Tender nostalgia and post-pub melancholia. 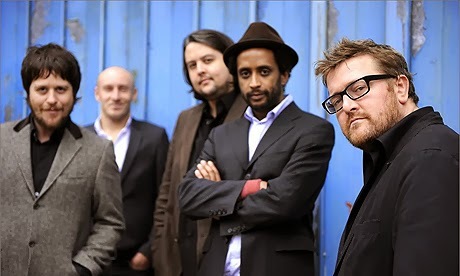 But the new track also comes with a demonic burst of saxophone and some beautifully enigmatic lyrical flourishes from Guy Garvey ("my oldest friends are a serious habit, Fly Boy Blues will bring your faces home, to my sweet trampoline and acres of crash-site love"). The song's accompanied by a short film, featuring footage from the year-long recording process for the band's sixth album, The Take Off and Landing of Everything, which is due in March. It’s nice to have them back.